The Biblical World: The Sisters of Jesus: Mary, Anna, Salome? Mark Goodacre has posted episode 50 of the NT Pod. In this segment Goodacre looks at the question of who were Jesus' sisters. Although people are aware of the names of Jesus' brothers, few give thought to mention of Jesus' sisters (Mark 6:3). Are they Mary and Salome or Anna and Salome? Listen to to the NT Pod what Goodacre has to say about this question. Also, at the NT Blog you can read Goodacre's take on Richard Bauckham's claim that there is a 50% chance that the names of Jesus' sisters were Mary and Salome. Yeshua's sisters were Lydia and Salome--Salome was Yosef's oldest daughter--Yacob was Yosef's oldest son. Yacob became the first bishop of yerusalem. Jesus had four brothers: James, Simon, Judas and Joseph. He had two sisters: Assia and Lydia. where is your scripture reference to support your finding please? Who is the artist that painted the picture? 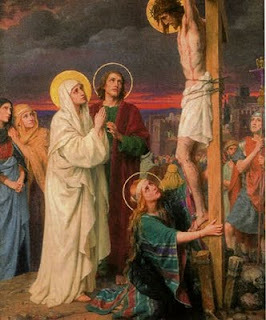 QAccording to the bible reference "his brothers and ALL HIS SISTERS are here with us indicates three sisters, not two. Many Bible experts agree that there were three, so what have you done with the missing one? The bible doesn't say what the sisters names are-nor the number, but is does specify that he had at least two sisters. Some traditions say their name's are Mary and Salome. The Catholic tradition is that they were not daughters of Mary. As Jerusalem was under Roman occupation during the time these children would have been born, I don't think the Blessed Virgin Mama would have given her girls Roman names. Esther, Mary, Salome or Rebekkah would have been more like it. As birth records were virtually non-existent, there is no way to know what Jesus' siblings were called or how many of them he had. Read Matthew 13:55 for Jesus' brothers name in the King James version. Mark 15:40 and 16:l in King James refer to Salome but I can't find any where else to support the other names. It makes sense based on what deadcat said that He had at least sisters. Maybe the three names (Anna, Mary, and Salome) are the names of all three of them. You might also be interested in knowing that the sons of Zebedee (John and James) are his cousins as are the sons of Alphaeus (James, Joses (Barnabas), and Simon (?)). Alphaeus also had a daughter named Mary who was the mother of John Mark. Simon Peter says that John Mark is his son his epistles, so it seems apparent to me that he and Mary were married. To recap, it seems from scripture that Jesus had four brothers, at least three sisters, five male cousins, and at least one female cousin. My understanding is that all of his cousins were on Joseph's side as the Virgin Mary was an only child, and that John the Baptist was the son of the Virgin Mary's cousin Elizabeth and his father is Zechariah. If you truely believe you will REPENT (turn around) and strive to live that perfect life. Just saying you believe and continue in sin will not bring you salvation. My New Book on Cain and Abel is out!